Creating your own dishware is a chance to get creative, customize it to match your kitchen theme or decor, or give someone a custom gift that means something to them. Decorating dishware, like coffee mugs, teacups, and saucers, is also a lot easier than you’d think! 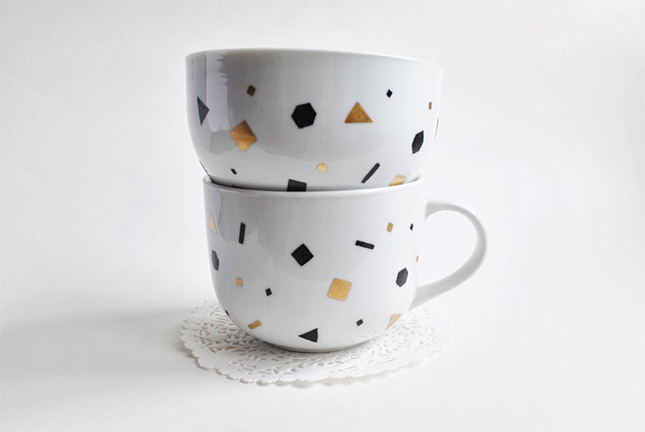 Whether you choose to decorate your cups and mugs with the sharpie and baking technique, all-surface paint, or another method you’ve learned through your crafting journey is up to you. Here are 15 great handmade cups and mugs to get your creative gears grinding when it comes to creating your own design! 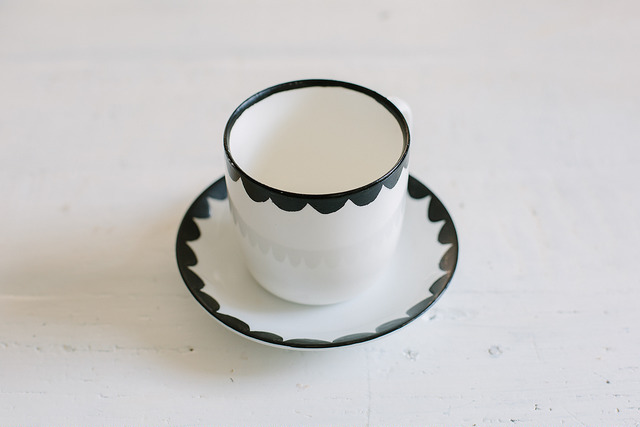 A Pair and A Spare shows you how pretty a simple scalloped edge can be along the top of a cup and the outer edge of a saucer. It’s an easy design to make but it’s an effective visual! The Etsy Blog shows you how to paint the perfect design for a warm cup of coffee or tea on a rainy day. Filling the drops with different shades of blue makes the rain more comforting and less gloomy. Some of the most fun we ever have crafting is when we get to recreate our favourite movie or cartoon characters! We love this adorable little painting of Chip from Beauty and The Beast featured on Be our Guest Gifts. 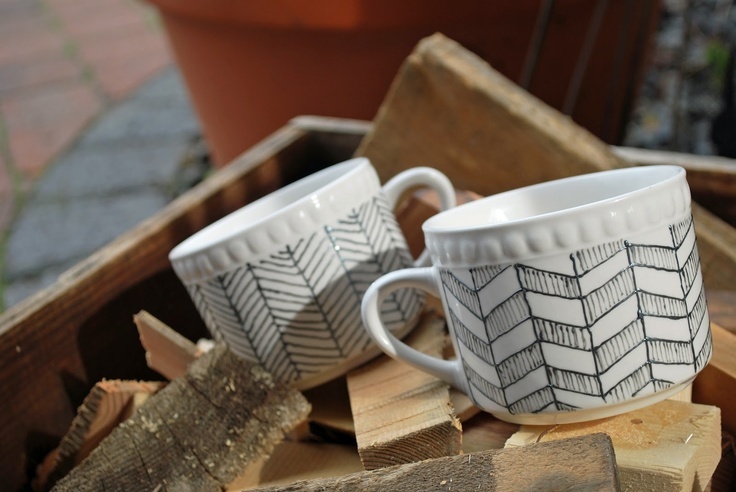 Drawings Under the Table shows you how to make a very thin, detailed shaded chevron design on the surface of a mug or teacup using a very thin marker. Try switching up the angle of the tiny lines inside your chevron shape to create a visually interesting little set. 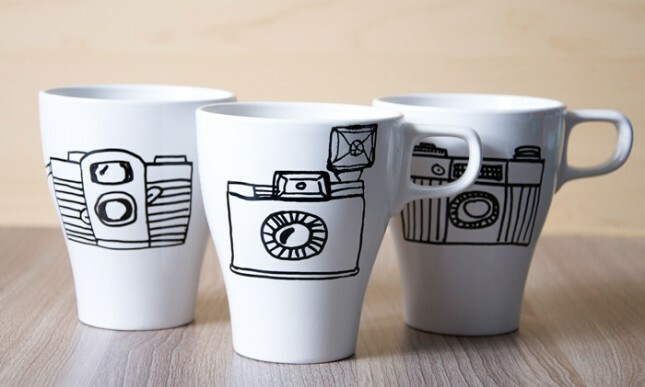 If you’re confident in your drawing skills, try sketching out little vintage cameras on each mug. 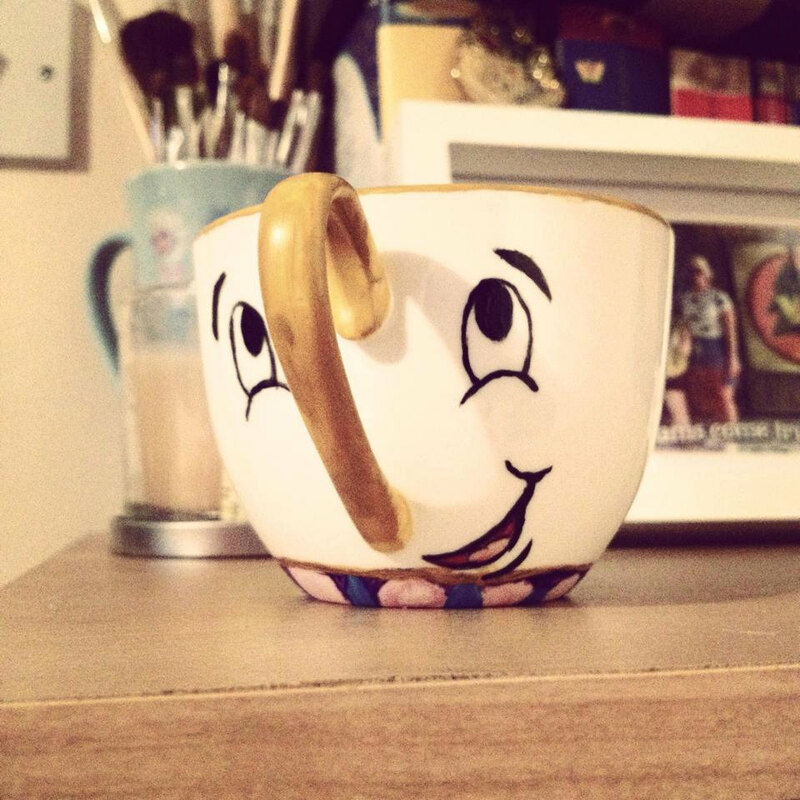 The more cartoon they look, the more kitschy and cute your mugs will be! We love these ones by Natalme. Sometimes you just need to get messy with your art! 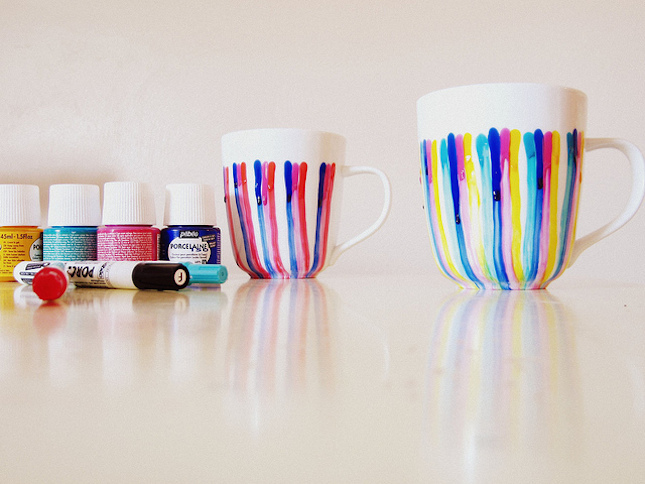 These adorable paint splatter mugs are the perfect opportunity to make something a little more abstract than most of the other designs on this list. 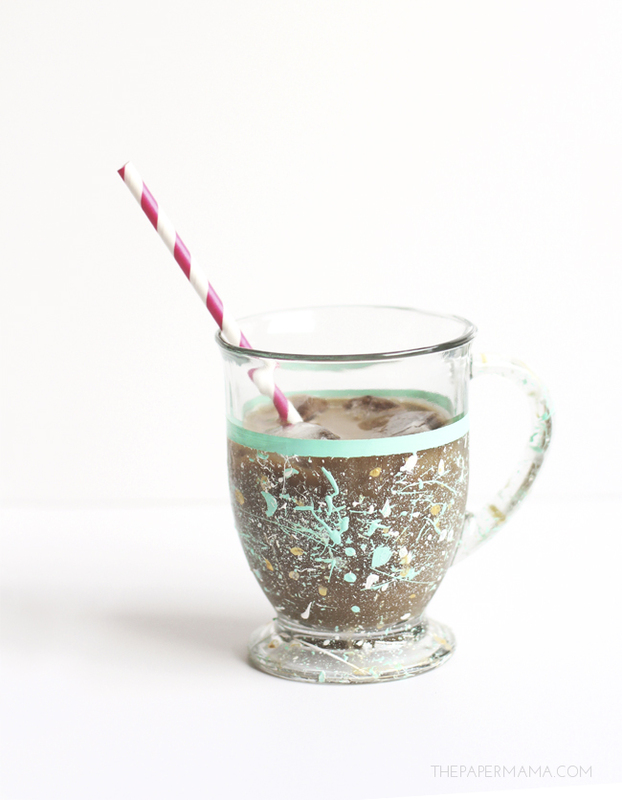 We love how the splatters look on a clear mug, like this one by Paper Mama. 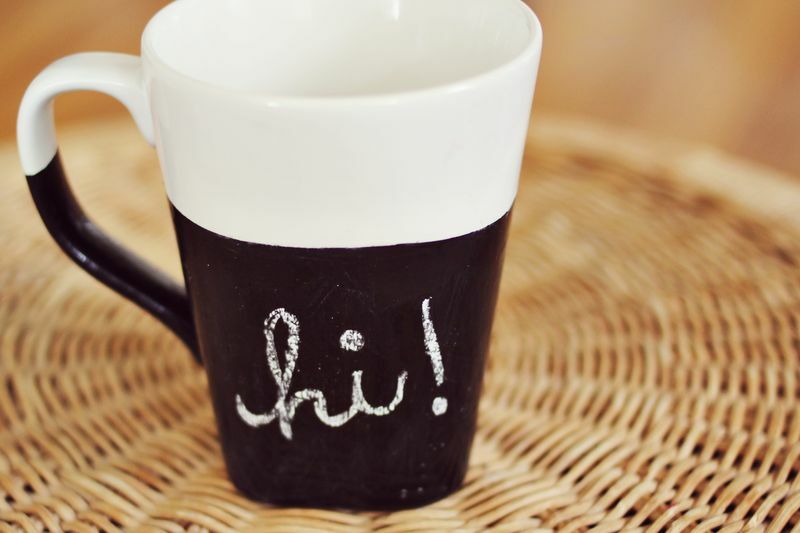 Thin permanent markers are a great tool when it comes to designing your own mugs and other dishware. They allow you to create detailed designs with small lines. Those designs don’t have to be simple just because they’re detailed though! 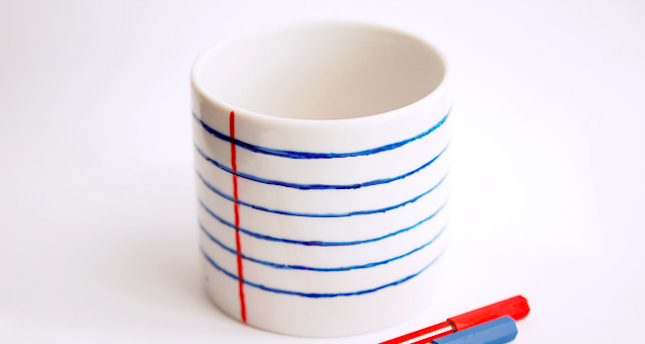 We love this notepaper mug by Madame Citron. Ornamelle reminds you that very simple designs can be just as pretty as the rest. 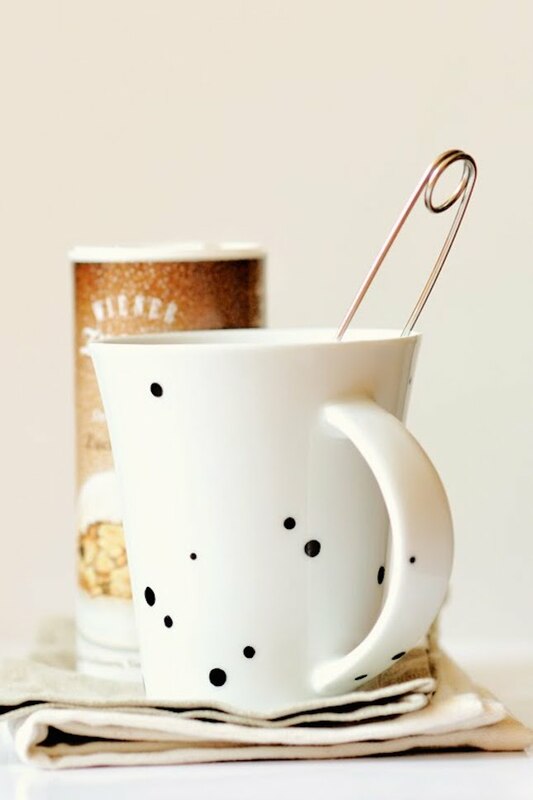 We love the stark contrast between this white mug and the differently sized black dots scattered around the surface and the handle. Sticking down tape in an overlapping geometric pattern is one of the best ways to ensure that you get very straight, clean lines. Freehand painting is fun, but it doesn’t always yield the same neat results. Crafting and Cooking shows you how to create a pattern that you can alter however you please. Are you looking for something completely different to make your custom mugs stand out? 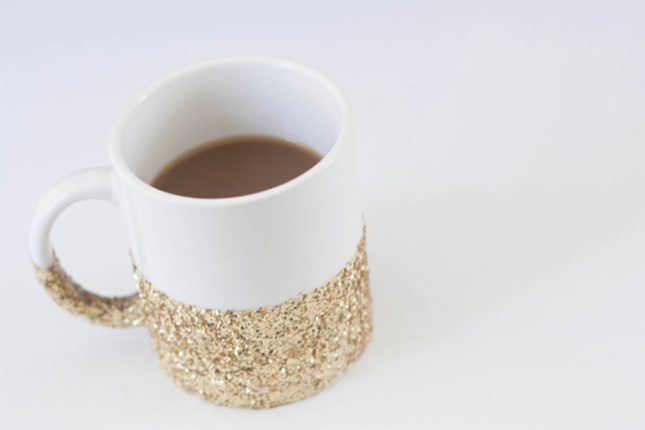 Feathers of Gold guides you through the super easy process of creating a confetti mug! Your main challenge here will be separating out the individual confetti shapes to make that cute scattered effect. 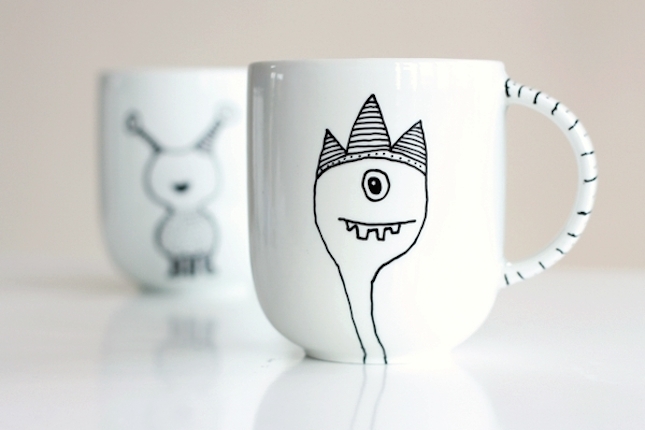 These mugs by Tuts Plus are just plain weird, and we’re completely in love with them for it! Let your imagination run wild and draw whatever little monster, alien, or creature pops into your head. Bake the mug so the design stays and enjoy a little piece of weird with your morning coffee every day! Sparkle lovers, rejoice! There’s a custom mug design out there made just for you! White House, Black Shutters shows you how to glitter dip a mug and seal the outer layer so that little pieces of glitter don’t shed onto your clothes every time you drink from it. 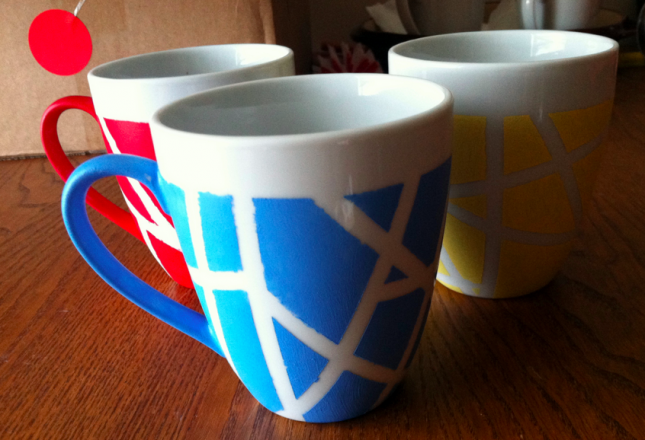 shows you how much fun painting at least part (or all) or a coffee mug with all-surface chalkboard paint can be! Use chalk to write a good morning message to the person you love and just made a fresh cup of coffee for, or to label your own drink at a brunch where many people have set their coffees near yours. 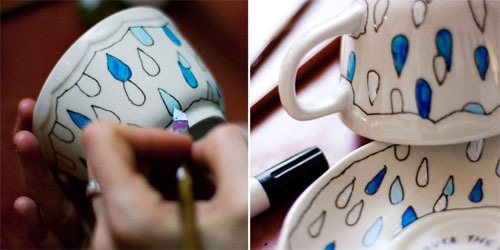 Thimbly Things teaches you how to make an awesome dripping effect down the surface of a mug or teacup using porcelain paint! We love the unfinished, artistic effect it creates, especially if you let a few drops dry where there are.. Studio DIY shows you how to make an adorable party themed mug that’s perfect for making and serving your friends a fun birthday drink in! 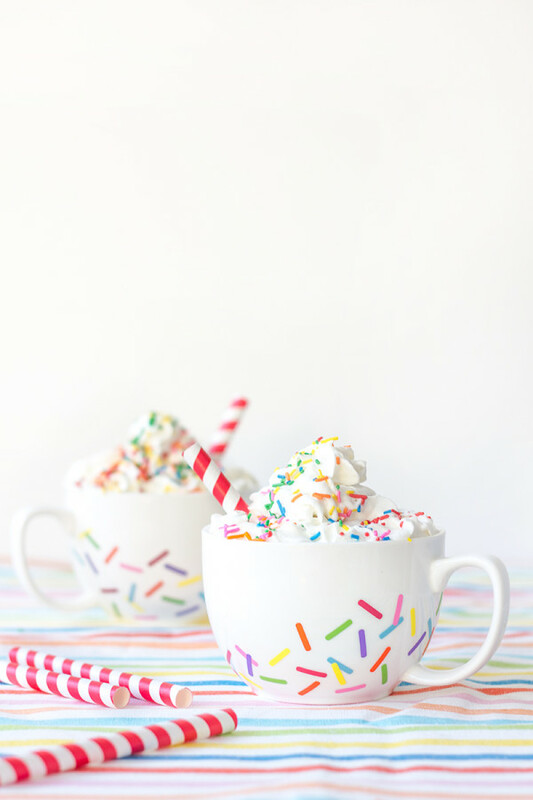 These bright little sprinkles will make anyone feel cheerful enough to celebrate just about anything! Do you know someone who loves making practical crafts, but doing so as creatively as they can? Share this post them with them so they can get creative in the kitchen!